Sales of air conditioners have exploded worldwide over the last few years, driven by middle-income countries where households and businesses are buying air conditioners at startling rates. My colleagues Max and Catherine have written about China, for example, where sales of air conditioners have nearly doubled over the last 5 years. 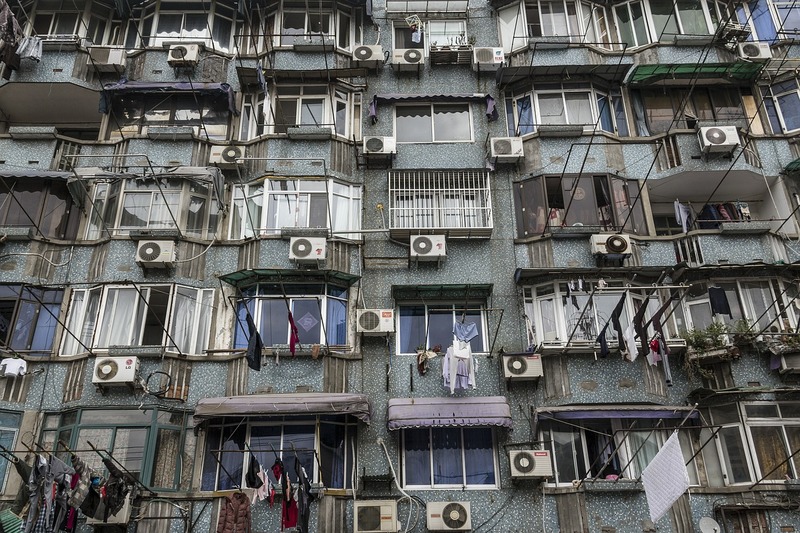 In 2013 alone there were 64 million air conditioners sold in China, more than eight times as many as were sold in the United States. In a new paper coming out this week in PNAS, Paul Gertler and I examine the enormous global potential for air conditioning. The paper is available here. Household incomes are rising around the world and global temperatures are increasing. Both factors will drive increased adoption of air conditioners. This is mostly good news. Air conditioning will bring relief to the more than three billion people who live in the tropics and subtropics. However, meeting the increased demand for electricity will also be an enormous challenge requiring trillions of dollars of infrastructure investments and potentially resulting in billions of tons of increased carbon dioxide emissions. Our evidence comes from analyzing rich microdata from Mexico, a country with an unusually varied climate ranging from hot and humid tropical to arid deserts to high-altitude plateaus. As the figure below illustrates, we find little air conditioning in cool areas of the country, at all income levels. Even at high income levels saturation never exceeds 10%. In warm areas the pattern is very different. Saturation begins low but then increases steadily with income to near 80%. 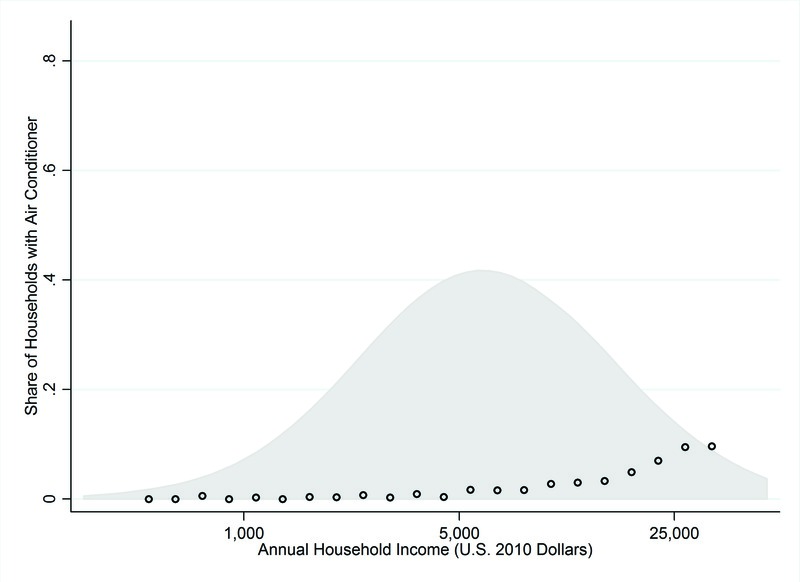 In gray is the distribution of annual household income. Source: Davis and Gertler, PNAS, 2015. We combine our estimates with economic and temperature change forecasts to predict future air conditioning adoption in Mexico. Under conservative assumptions about income growth, our model predicts near universal saturation of air conditioning in all warm areas within just a few decades. Temperature increases contribute to this surge in adoption, but income growth by itself explains most of the increase. 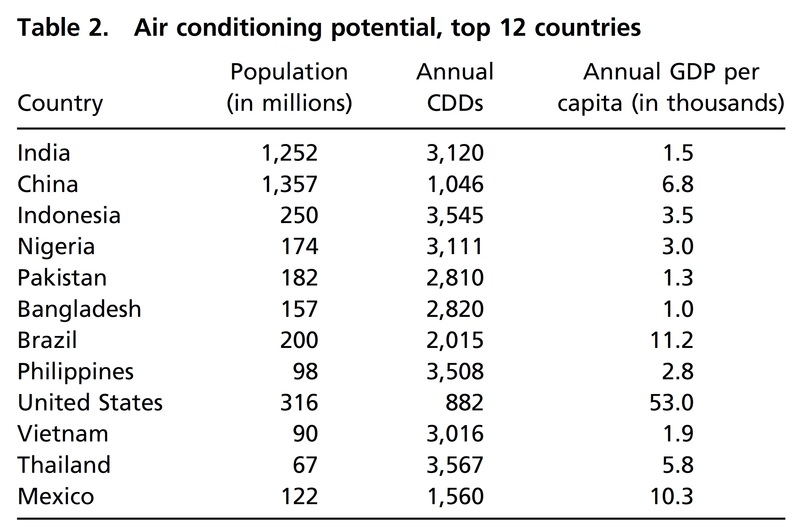 To get some sense of the global implications, the table below lists the top 12 countries in terms of air conditioning potential, defined as the product of population and cooling degree days (CDDs). Excluding the United States, the list is dominated by middle- and low-income countries with warm climates. A total of almost 4 billion people live in these 11 countries, subject to an average of 2,700 annual CDDs. Take India, for example. Compared with the United States, India has four times the population, but also more than three times as many CDDs per person. Thus, India’s total potential demand for cooling is 12+ times that of the United States. India already experiences frequent brownouts and blackouts, as Catherine blogged about here, which would be exacerbated by increased air conditioning if infrastructure does not keep apace of demand. What air conditioning will mean for electricity consumption and carbon dioxide emissions depends on the pace of technological change. Continued advances in energy-efficiency or the development of new cooling technologies could reduce the energy consumption impacts substantially. Similarly, growth in low-carbon electricity generation could mitigate the increases in carbon dioxide emissions. The future pattern of air conditioning adoption will also reflect what happens to prices. Equipment prices are likely to continue to decrease, which would further accelerate adoption. What will happen to electricity prices is less clear. A substantial increase in electricity prices, for example, resulting from carbon legislation, would slow both adoption and use. Finally, there are broader adaptations that over a long time period could substantially reduce the need for air conditioning. Previous studies have found that people move away from regions affected by extreme temperature, so migration could mitigate the need for air conditioning. Demand for cooling also depends on how we build our homes and businesses, norms that can evolve over time in response to changes in climate as well as the availability and cost of cooling technologies. 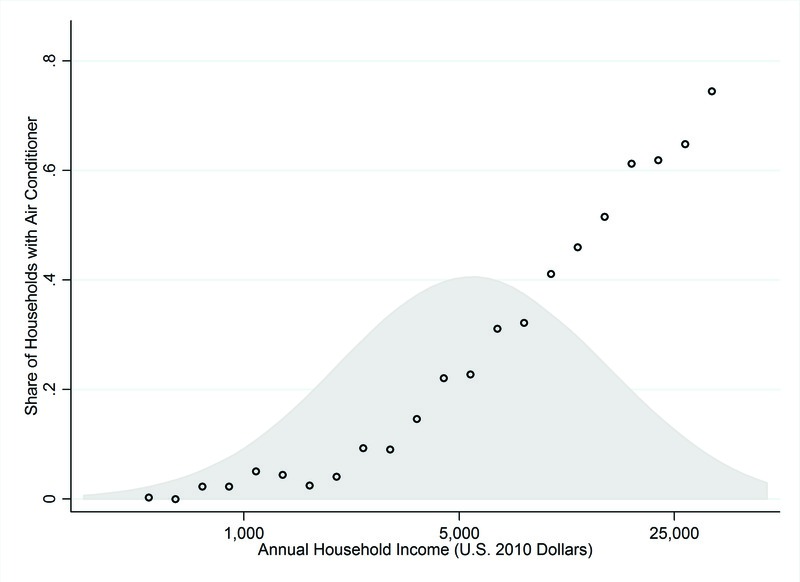 The continual increase in global incomes means people are living more comfortably. This should be celebrated. But at the same time, it also means real challenges for electricity infrastructure and the global environment. We need an “all-hands-on-deck” approach including aggressive funding for innovation, efficient pricing of energy, and evidence-based environmental policies. We need efficient markets if we are going to stay cool without heating up the planet. Next Next post: Is the Future of Electricity Generation Really Distributed? As a global community we really need to prepare for the effects of larger air conditioning use. As the study says, we know that we will need to start pumping millions into infrastructure developments in order to handle electrical needs that we’ve never had before. On the bright side though, this will increase the quality of life for hundreds of millions across the planet. Hot places also require more water which in turn uses a lot of electricity to move and creates problems with storage accelerated through droughts. •	Air conditioning in Saudi Arabia accounts for roughly 70% of electricity consumption in residential, commercial, and government sectors during the summer system peak hours. •	AC electricity consumption is perfectly coincident with system peak further aggravating the supply / demand power balance. Electricity demand in Saudi Arabia has grown at a rate of 7 – 10% annually for the past ten years. The high demand growth rate is directly a function of growth in income, population growth, increasing intensive use of air conditioning but also low electricity rates and the use of AC equipment with low EER value. The impact on demand and in conjunction the grid is compounded by the extensive use of air coolers, window, and split system units but also package units and DX. This equipment tends to have an EER in the range of 5 or 6. The result being that on average, HVAC equipment in Saudi Arabia is operating at half the efficiency level HVAC equipment is operating at in many countries in the world not accounting for ambient conditions degradation effect. Accounting for the degradation effect would put HVAC equipment installed at significantly below 50% of the efficiency of equipment operating elsewhere in the world. •	Reasonable increase of window, split, package and DX units efficiency standards alone can result in major reduction in AC coincident electricity demand. •	The construction of significant power generation capacity in excess of 9,000 MW can be avoided through the implementation of improved HVAC and envelope efficiency standards. •	Recent introduction of AC efficiency standards are expected to provide some of the corrections suggested in our study. You are obviously right that the uptake of air conditioning is rapid and will continue. I concur that innovation, efficient pricing of energy, and evidence-based environmental policies are good. However I think you miss the obvious addition — reduce the need for air conditioning by doing what we already know works — insulation, air sealing, good windows — these are much better solutions than casting about with billions hoping some technological breakthrough will save us from our collective stupidity. With respect to “efficient” markets — those are a figment of economists’ novels. There is no invisible hand. We see that US consumes much more energy than comparable European countries, how much of this could be caused by greater number of CDDs compared to Europe? We all know that China has a “first things first” survivalist culture — or what they consider survival at least — which precludes environmental issues; please don’t bring up solar panel production, this will only bate me into a discussion of motive and why I believe that solar photovoltaics “do not work”. Anyone who has visited China knows first hand that its energy hunger is no phenomenon; China’s entire infrastructure has been rebuilt for industrial production within a mere 30 years with almost ant colony like precision, one collective unstoppable mind. There will be no convincing the Chinese of anything in my opinion. How about convincing ourselves? Wouldn’t it be nice to have a domestic energy policy that actually cleared obstacles to introduce new renewable energy technology; however, apathy remains cloaked in the Emperor’s Invisible Threads of “concern” and “study”, and of course proper “process”, throughout academia and government. Let’s do something besides talk please! Surely humidity also has an influence on demand. Température in the middle 30s Celsius is perfectly bearable if humidity is low.